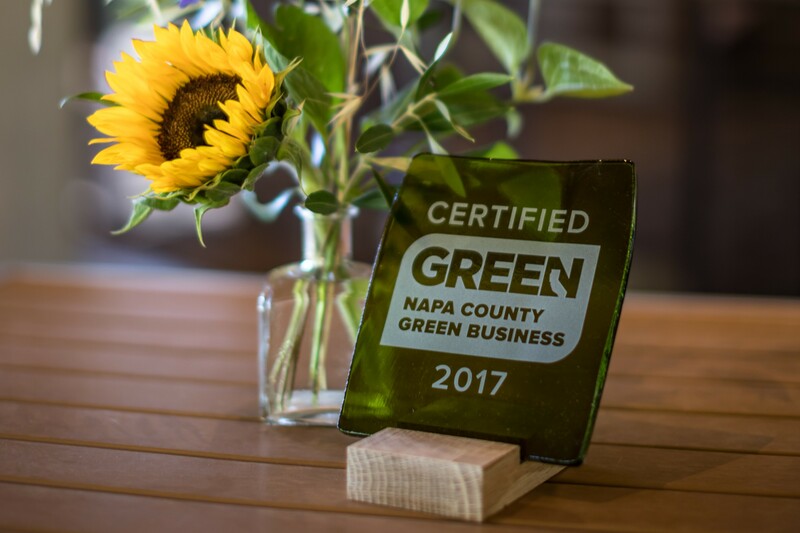 7/17/2017 - St. Helena, CA - Last Thursday, 50 Napa County businesses were recognized for their commitment to environmental sustainability at the inaugural Napa County Green Business Celebration. Co-hosted by the Napa Valley Vintners (NVV), Sustainable Napa County and Napa County, the celebration acknowledged local businesses and organizations that received their Green Business Certifications or were recertified in the past 18 months. Attendees included more than 100 business leaders, vintners and community officials. Jeri Hansen-Gill, CEO of Sustainable Napa County, emceed the program. “More than a decade ago, when the Napa Green programs were developed, it was impossible to estimate how crucial they would become,” said Hansen-Gill. “At once the Napa Green Business program is practical and symbolic; it is a guidepost for anyone who needs direction and inspiration for those who may not be sure of what to do or how to start.” Following her remarks, Hansen-Gill was joined by Chair of the Napa County Board of Supervisors, Belia Ramos, to present each honoree with a custom award made from repurposed wine bottle glass and wine barrel staves. The goal of the Napa County Certified Green Business program is to preserve the unique place that is the Napa Valley. Launched by Napa County in 2006, today it is part of the California Green Business program and has evolved to include Napa Green Certified Winery, specifically for wine production facilities. Through the Napa County Certified Green Business program, businesses demonstrate their care for the environment by going above and beyond 'business as usual.’ Napa County Certified Green Businesses use eco-friendly products and environmentally sustainable business practices. Learn more at greenbusinessca.org. The Napa Valley Vintners nonprofit trade association has been cultivating excellence since 1944 by inspiring its more than 530 members to consistently produce wines of the highest quality, to provide environmental leadership and to care for the extraordinary place they call home. Learn more at napavintners.com. Sustainable Napa County (SNC) is a 501(c)3 nonprofit dedicated to engaging the community in issues related to energy – exploring opportunities and finding practical solutions to our challenges. SNC believes that together we can make our economy stronger, our environment healthier, and our communities more connected. Learn more at sustainablenapacounty.org.